Saturday night was the final of the 19th GulfCup Championship. The support Omanis have for their team had been incredible through this championship for Gulf countries soccer supremecy. The number of Omani flags and buntings were all over street corners and in much greater numbers than during Omani National Day. Cars were awashed with red white and green colors and strips. After the semi finals a few days ago, cars were taken to streets in massive parades with people sitting precariously on car roof and hanging out of windows beating drums and waving flags. Dancing parties were out on streets beating drums and waving flags. Traffic was at a crawl, and repeated all over Muscat and Oman. By time you read this, she might have uploaded shots of celebrations after the final. So the final on Saturday night between Oman and Saudi Arabia was as tense as could be imagined. Both were very good teams and both goal keepers made spectacular saves driving the game into extra time. Which remained at 0-0 after the extra time. This lead to penalty shootouts which stood at 5-5. Then into sudden death penalty shoot-out. Saudi missed the goal. And Oman slotted in that reply. And Muscat and Oman went wild, a wildness that waited 35 years for this cup. The frenzy of celebrations began with car horns going off everywhere. Cars on road flashed emergency lights. We got into our car to join the traffic on the street to see cars all decked with flags and people. This car had on streamers of flashing red white and green lights. We came back home at 11 pm , but that celebrations went on and on. Next day, Sunday, as I prepared to go to office, I received a text message that the office will be closed for that day as the Sultan of Oman declared that day to be a public holiday for all in celebration of the soccer success. 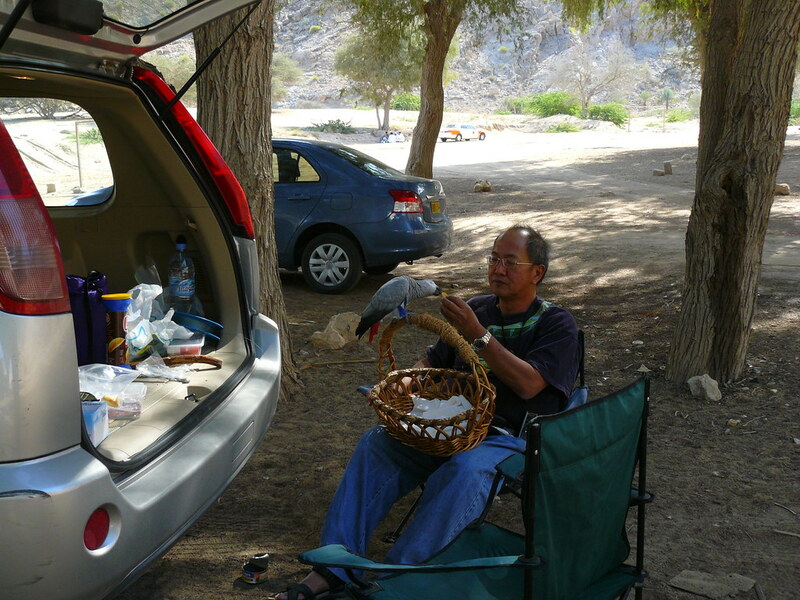 After that trip with Riamfada to Al Koudh and Fanja on Friday which went rather well, we thought we would take Riam out on this public holiday too. While Riam was save in the cat carrier, Riam was not that happy and chewed and chewed the carrier. That made me unhappy as it was supposed to be a happy outing. So I hung up the ring in the car. Threw the basket to the back seat, and had my wife resting the carrier on her lap. Riam was placed on the ring, and if it did not go well, I would pop Riam into the carrier. Riam remained on the ring for a while, then she got on top of carrier. And made her way to my wife's shoulder. For long drive, that would not be good as that was also precursor of Riam getting to my shoulder. I was about to stop the car to pop Riam into the carrier. She flew to the basket on the back seat. And remained contented on the basket handle. I stop the car, and my wife joined Riam on the back seat. My wife reported Riam was very happy there, periodically looking out of the windows with interest on the scenery flashing past. I was delighted with this arrangement. And decided we go for longer drive this time and picnic out. We drove pass Qurum into Muttrah souq and Muscat old town. The flags, buntings and banners were still up and fresh and fluttering all over. The day was beautiful clear blue with brilliant sunshine that brought a bit of warm into the 18 C day. Our first stop was at this seaside park just afer Muscat old city. At the park entrance were the posters about no-no list of things. You cannot play ball, ride bicycles and walk your dog. Riam was clearly not a dog, and that list did not exclude her. We sat for a while at this cafe table under a tree having a cup of hot milk tea. People passing us quite uncertain about us. 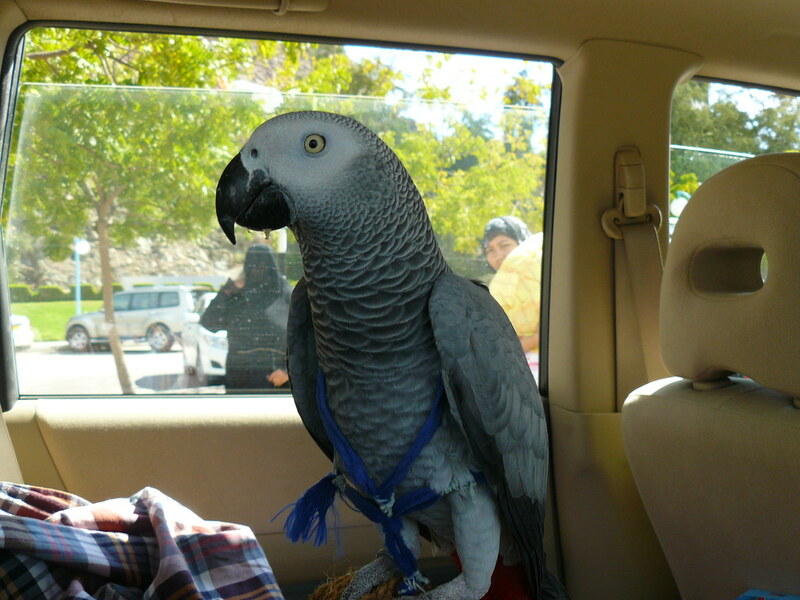 Riamfada would do her part for other parrots kept in Oman. 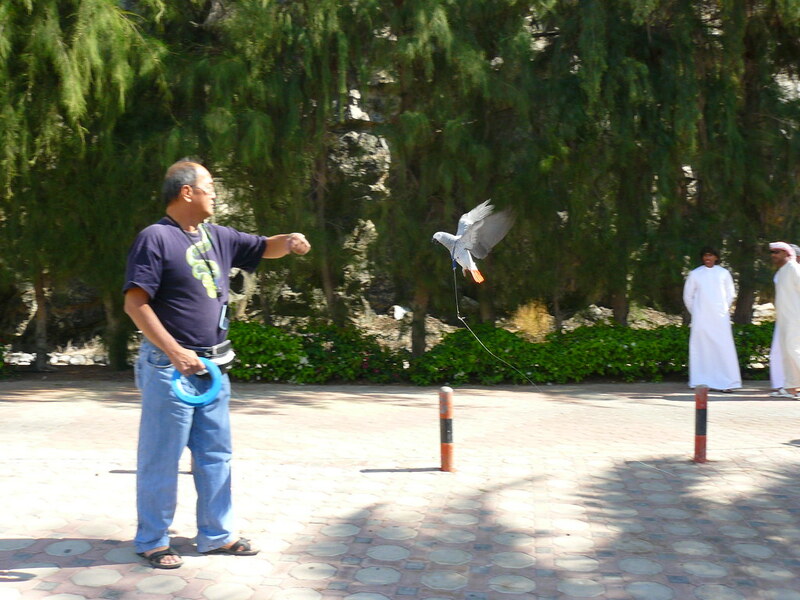 That life for parrots here might not be forever in a cage. The socialising for Riam would add to her poise, and be food for thoughts for any locals that encountered us. People started to come to admire Riam. Got to hold her perch and their photos taken by friends. Got to hear from me about the care and food for parrots. Riam did a few recalls for all of them. And they got to know more be found when they google Tinkerbell parrot. We then continued on. We were on on way to Yiti beach. 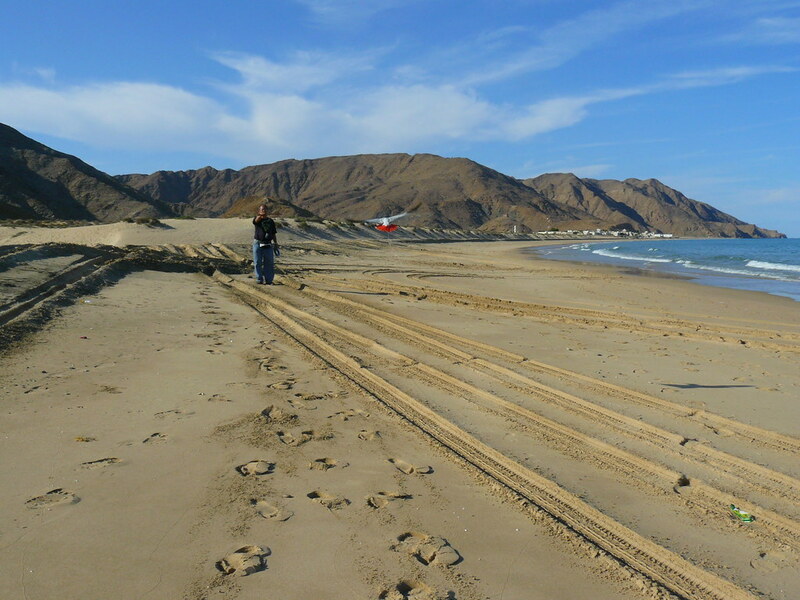 The Hajar mountains came all the way to the coast. We passed spectacular cuts in the mountains as the road weaved its way up and down and through passes. 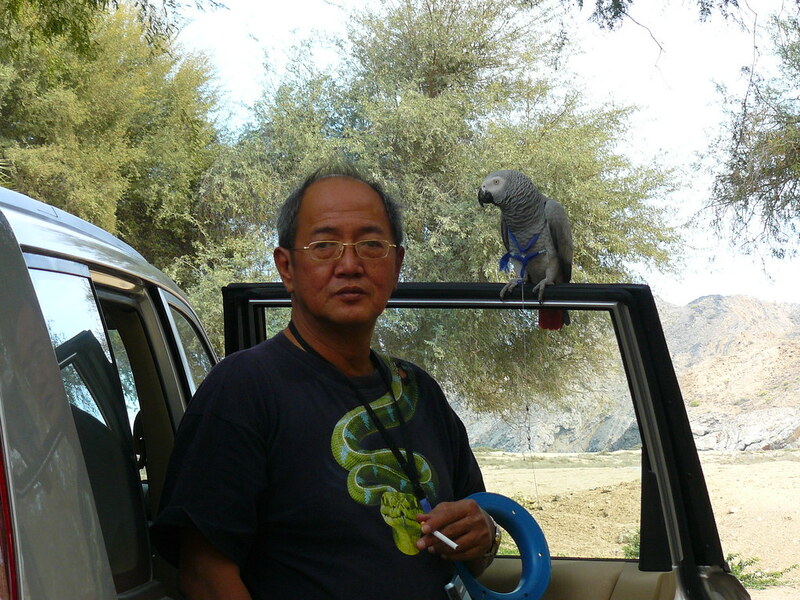 What went on in Riam's mind I wondered as we drove at 120 kph passing through a beautiful city and countryside. Riam passed places and sites at speed beyond her flying ability. My wife reported she looked right, and left, and ahead as I drove. She did happy vocalisations now and then. Getting sunflower seeds from my wife now and then. We reached Yiti beach and parked the car under a tree. Riam came out as we explored the village followed by a bunch of kids intrigued with Riam on my shoulder. Later on, we were back at the car. The back was opened up and we took out the deck chairs, using the boot as a table for our picnic lunch of can sardines, tuna and can fruits. Riam remained on her basket placed on my lap. I decided no recalls to be done as we were under a spreading tree. Bunches of common mynahs with the occasional brilliant blue bee eaters flying about. Just before reaching Yiti beach, we saw a road sign to Seifa, a beach we heard lots of good things about. That was where we went to next. That road had us climbing up and down steep roads. Even though the road was tarmac, I was glad we were in a four wheel drive. I had thought the road to Yiti was gorgeous. The road to Seifa surpassed that even more. We reached Seifa, a big town at the edge of the sea. Seifa was at one corner of a huge bay and enormous beach that I reckoned to be at least 4 km long, lapped by clear blue waters with dunes a bit further back from the water line. The vast expanse tempted me to do some really long recalls. 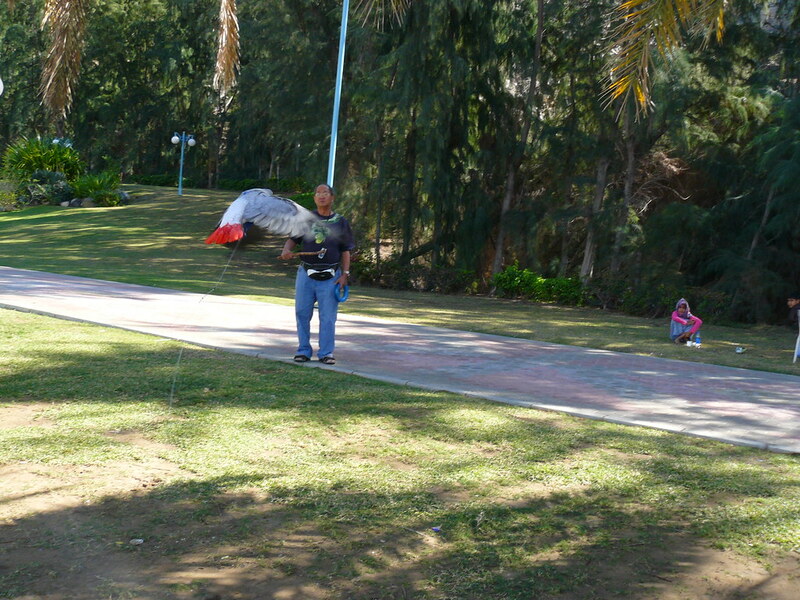 Riam was set on her basket and I walked back 40 meters away with my wife blocking her view of me. I called, and called, but Riam did not fly to me. I walked back to make it a 20 meters recall before Riam responded. I tried that two more times, and in each case, had to walk back to about 20 meters before Riam responded. This contrasted with the 70++ recalls with Tinkerbell. But then, Tink never had her wings cut, and those 70++ meter recalls were done around the later period with Tink. 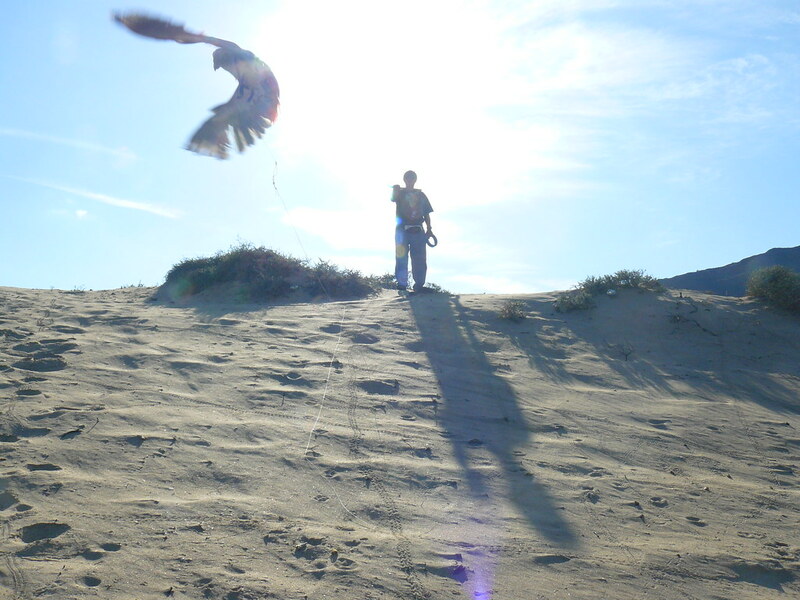 I made use of the dune to do some height recall with Riam. 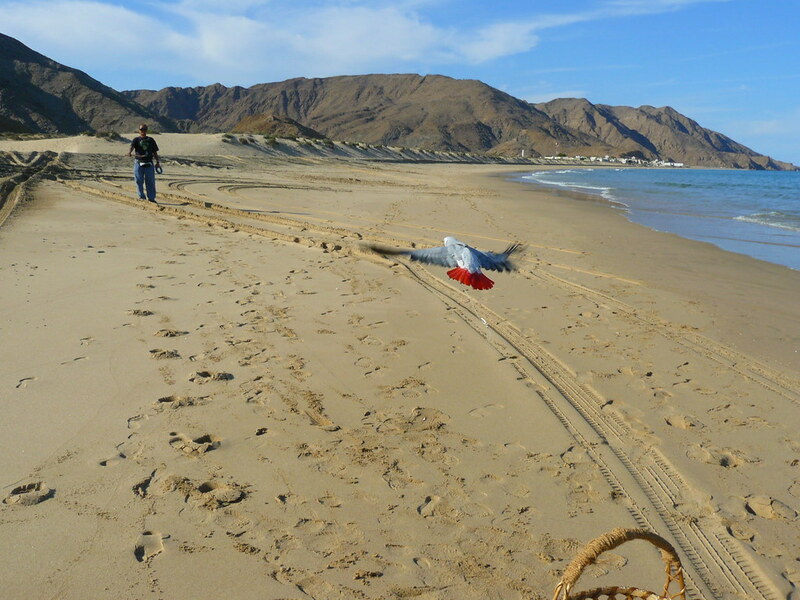 With Riam on her basket at the bottom of the dune, I made my way up that 10 meter high dune. At cue, she flew up to me. Walking up even a 10 meter dune was not easy and that was not repeated. On the way back, I turned into a side road that pointed to Seifa Al Sheikh curious as to where that might lead us. That road was spectacular too. And we reached a delightful little cove and a small beach perhaps 100 meters long. This would be a place that we would go to again and again in future. We then headed home late that afternoon. 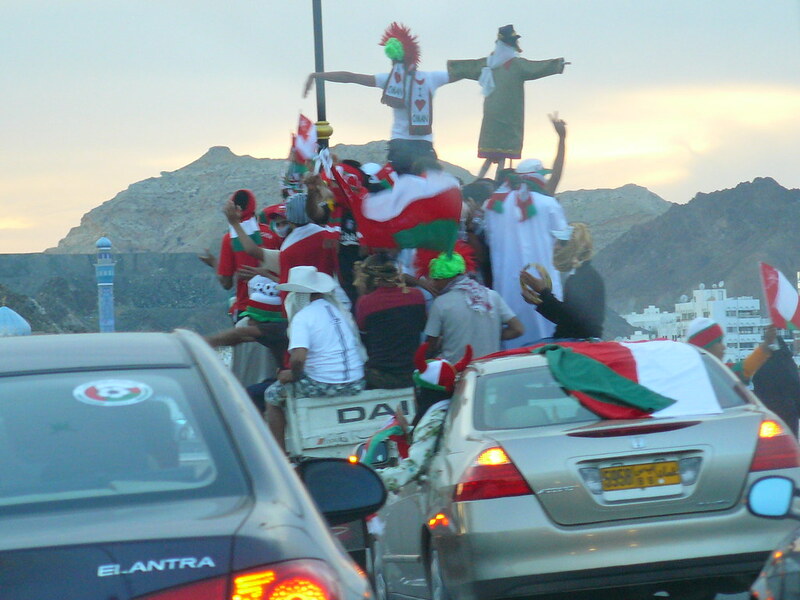 When we passed Muscat, we were caught up in crawling traffic stuck in convoys of cars decked out with colors and celebrating that soccer victory the other day. The celebrations continued, with groups of people on the side of the road waving flags and banners at the parade of cars and people on roof of cars waving flags and banners back to them. Harley Davidson motorbikes were there in a huge massive parade all decked with colors. It was a snail crawl all the way from Muscat old town and through Muttrah. We enjoyed it all. I wound up the windows in case the horns and drums frightened poor Riam. Riam enjoyed it all until the last bit when it was late and the sun faded. She got agitated and I placed her into the carrier. She got back into her room and had her mash before lights off for her in her room. Kitties were happy to see us back and to get their kipples. Katie had been a lot nicer to me since I rescued her a few days ago. Even if she kept trying to maim me with her figure of 8s curling about my ankle. Late in the night, she came back into the house with a present for us. At least this was intact unlike the presents Ivan had brought me when we were living in Hongkong. It was a mouse, and still alive to our shock. I hold Katie away, and that present was taken out on the floor mat it was on. 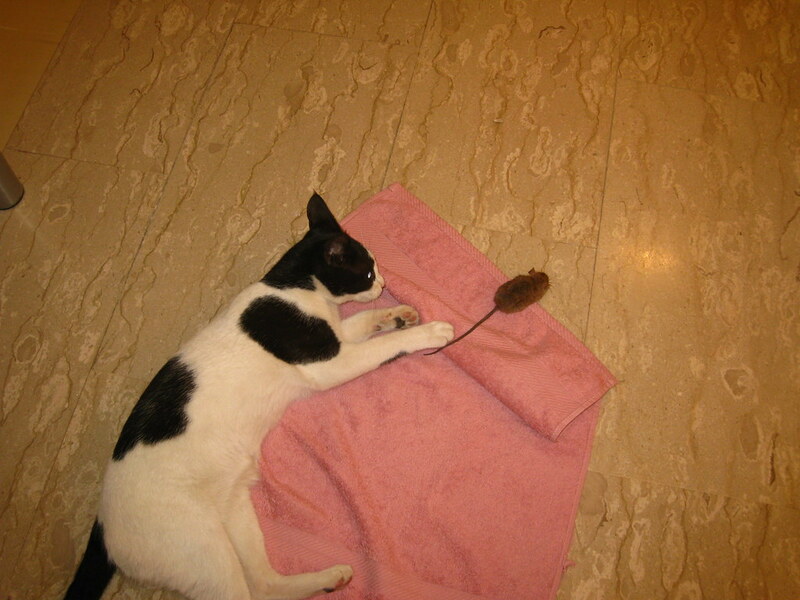 I shook that in the public garden across the road from our villa and hope that mouse would recover and not be re-presented to us again.